Photoshop or not, foregrounds help. 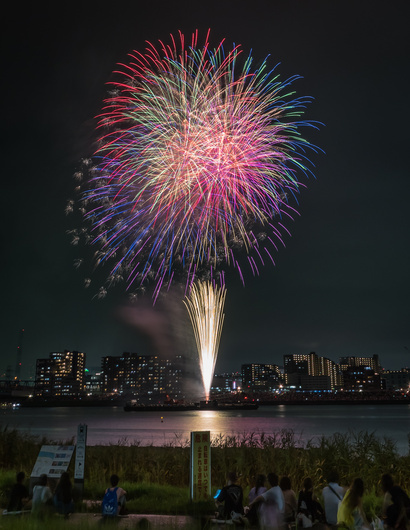 Last year, I went to my first 4 fireworks events in Tokyo (we have tons) where I took and processed photos without using photoshop. This year, I've attended 2, so far, and I've decided to try some composite shots. I try to keep my composite shots as realistic as possible, with the hope of making the viewer feel like they are at the show. However photoshop or not, one this has remained the same. I always try to use a foreground in my photos (normally people). Due to strict-ish privacy laws here in Japan, I have to ensure no one is able to be identified, so I have to wait until the perfect moment to capture my foreground for the composite shots and blur any faces. I've found a foreground helps with the scale of the fireworks, and adds a little something extra. Around the web I've seen so many people just photographing the fireworks without a foreground, but I can't help but feel those photos are missing something. My advice to anyone trying to improve their fireworks photography is to try using a foreground interest. 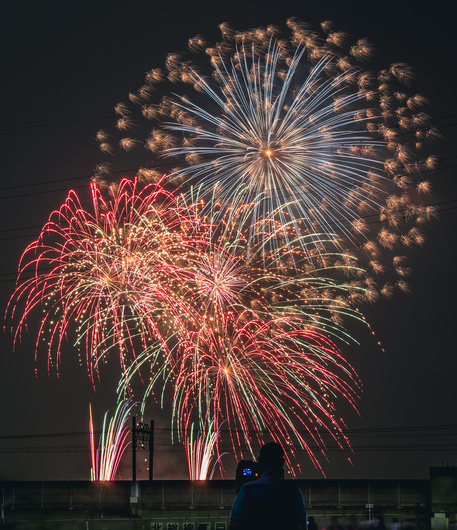 Do you have any advice for people looking to improve their fireworks photography? I know my photos are far from perfect, but I think I'm improving with every even and every photo. I have a ton of events still upcoming between now and December, so I'm open to any feedback on how I can improve my work, since it's difficult to look at my own work subjectively . Personally, I seldom include people in my shots as I shoot longer exposures(8 to 30). Unless I find a willing couple who will hold the pose during the shot(I usually have them kiss(who wouldn't!!)) .......or pose(her back to his chest, his arms around her, standing or sitting off to one side at 45 degree angle to the camera. Mostly I try to include something to help identify the location and who ever was sponsoring the fireworks. The fireworks in my top two were about 6-7 sec exposures. The last two were longer maybe 9-10 sec. Unfortunately a mixture of light pollution, rate at which the fireworks are launched, and the angle, I’m unable to do any longer than that without avoiding an overexposed mess of color (about 13,000 fireworks at big events). 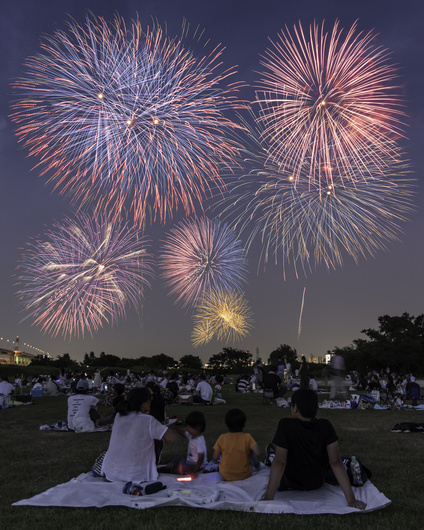 If you want a spot with a head on angle of the fireworks you often have to pay upwards of 15000 yen at big events ($150 before exchange rates), so I go with the free public areas. The main reason I started using people as a foreground was out of necessity. 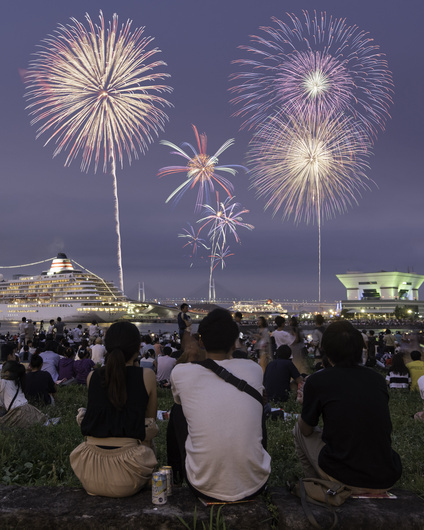 An average of 600,000 people attend each event in Tokyo, so finding a good spot without someone in front of you is tough, unless you arrive hours in advance. So I decided I’ll use them to my advantage. I’ve also thought about asking people to pose, but being a foreigner who is socially awkward, I find it difficult to ask people if they can pose for my photos, because I’m not a pro. I do, however, have to ask people to stop standing in front of my camera from time to time, haha. As for the kissing part, many people see public shows of affection as off putting here. Even at weddings the groom sometimes kisses the bride on her cheek, rather than her mouth. I like to include foreground or some sort of other subject in fireworks. But i'm struggling with the genre itself a lot. 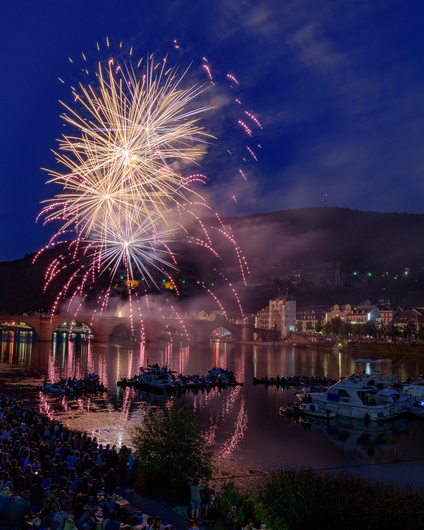 In my hometown we have a firework 3 times a year in front of our castle and old town bridge, which make for good side-subjects. The issue is that they turn the lights off during the firework. So one day i'll have to do some blending, right now i don't have the skills for that. I'm also struggling with exposure. If it's too long everything becomes a blur. If it's too short everything apart from the explosion is black. Additionally we always have so much smoke here that after the first few shots there are really ugly reflections in the clouds. Maybe later when I'm home i can add an example. I’m super lucky, we have more events than I can count in Tokyo. For the lights, do they shut them off just before the event? If so, you can take the foreground photo before the show starts and then take the fireworks shots without moving. Even if you have to move, you can still composite the fireworks in. As for composites, they’re actually easier than you think. I’m awful with photoshop, I just bought it in February, but I’ve still found it manageable. Are you using photoshop? Regarding the exposure, it can be difficult. It all depends on how many fireworks are launching at the same time. Personally I find when they launch one or two at time the best opportunity. It also depends on the style of firework and your angle. Japanese people seem to like the ones that explode, then sparkle, and they don’t photograph well at all, so a good chunk of the show I end up standing there. For the timing, I open the shutter as the rocket launches and then close it just before the firework disappears, unless it’s dark enough to expose for two. Honestly, it’s a little bit of luck as well, if I take 200 photos 20 of them may be usable. I almost always pack up my camera before the grand finale, because its nearly impossible to photograph and I want to beat the other 600,000 people to the train, haha. No i didn't touch Photoshop yet. So far i was busy learning Lightroom. But i would definitely interested in some of the options it offers. Yeah, the event has several stages. I just checked my photos from this month. 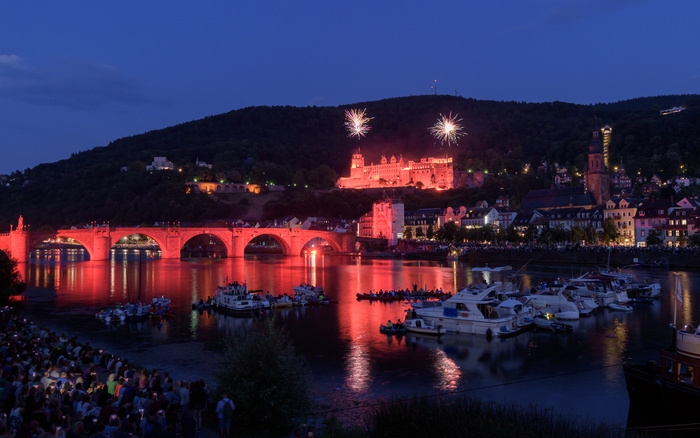 First they shut off all city lights, then there is a lightshow and small fireworks on the castle, then big fireworks from the bridge. I'll work out how to blend it all together. Your first image looks so clean. For me they all look a bit messy. I attached two images to show what i mean. In the first one i'm having trouble to get the red highlights under control. In the 2nd one you can see the smoke i mentioned. The exposure on the second one looks good. Personally I think I prefer it without the lights on, all you'd have to do is use the brush tool to raise the shadows on the castle. I've found that colored lights rarely photograph well. I had a similar problem with the Rainbow Bridge Fireworks, last year. When you put the fireworks on the background layer, and you lighten the layer, the smoke should stand out a little less, and you can erase it on top of a background layer of the bridge and castle. I think the biggest challenge will be the reflection in the water, I'm not that good at photoshop, yet, haha. I would suggest learning how to use luminosity masks if you want to exposure blend. I watched this video on Fstoppers the other day and got it down after just a couple hours of practice. They also help with making selections of a particular part of an image you want to brighten/darken with a curves adjustment. I did download the free Photoshop extension he talks about in the video, I don't know how I'd exposure blend without it. Right now I use the lighten layer method. I’ll have to watch the video and see if any of it applies to Photoshop Elements. I’ve found that most pros assume everyone has it, so a majority of photoshop tutorials are incompatible. It’s very difficult to find a YouTube photographer who focuses on the everyday photographer, rather than pros.